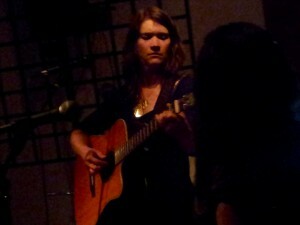 Kate Kilbane performing her rock opera The Medea Cycle, 06.22.12, Red Poppy Arthouse, San Francisco. 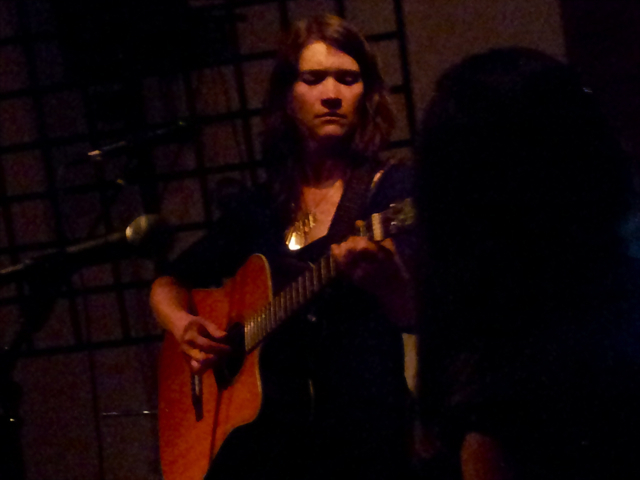 Back in June I attended an absolutely packed performance at the Red Poppy Arthouse in San Francisco. People were standing in a hallway behind the performers catching brief glimpses of the band’s butts between curtains and amps because there was literally zero square feet of space remaining in front of the stage; I was lucky enough to perch myself on half a stool about 3/4 to the rear, so I occasionally got to see a face. The band hasn’t repeated that performance since that night. Granted, the Red Poppy is not much bigger than a spacious living room, but I think it’s fair to say there’s probably some pent-up demand. What inspired such a fervent following? Was it some hot new low-fi, dubstep, bluegrass buzz band or whatever the latest trend is supposed to be? No, it was, of all things, a rock opera based on a Greek myth. Sure, why not? And you’ll have a chance to hear it in its entirety next week—the only performance planned for the rest of the year. My advice: Get there early unless you want to get stuck with an obstructed view. Based on one of the original “a woman scorned” tales, The Medea Cycle was written by local singer/bassist Kate Kilbane and her husband, Dan Moses, who also is keyboardist for backing band The Cellar Doors. The 12-song composition has become one of my favorite releases of 2012. As rock operas go, it eschews dense prog-rock pretension in favor of short, sweet pop songs with clear verses-chorus structures. The lyrics hew closely to the Medea myth, but you could listen to any individual track and remain unaware that they’re part of a larger story about the title character’s tragic romance with Jason (of Golden Fleece fame). The poppy music might seem like an odd fit for such a dark story, but Kilbane brings out the mischief and sorrow stirring beneath the surface of all those breezy melodies. What really made the show I saw was the narration Kilbane provided between each song that fleshed out the story. It was worth the price of admission just to watch the girl, maybe 9 years old, in the front row—her mouth agape, her eyes filled with wonder—bewitched by the story of a young woman struggling to control both the powerful magic and emotions roiling inside her. The upcoming show is all-ages as well, so bring the kids. They’ll be spellbound. When: 7:30 p.m. Saturday, March 16; doors at 6:30 p.m. This entry was posted in Bay Area Music, Events, Local Bands, Music, Worthy of a Shout-Out and tagged Kate Kilbane & The Cellar Doors, rock opera, The Medea Cycle, upcoming shows. Bookmark the permalink.